Do you draw your schemes and designs in the secret free "CAD" application by Autodesk? This was inspired by the Autodesk's secret free design application blog post on the RobiNZ CAD Blog. 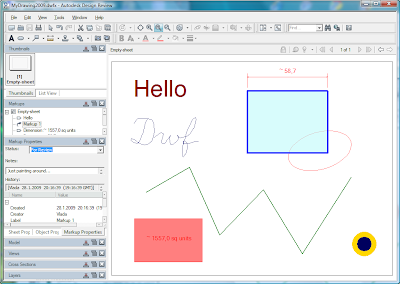 In Design Review, you get a toolset of simple shapes, texts, polylines, freehand drawing, dimensioning tools (length, area, angle), color selection (line+fill), transparency settings, grip editing, symbol libraries, advanced plotting tools and more. The file format for this "CAD" software is of course DWF and DWFx. 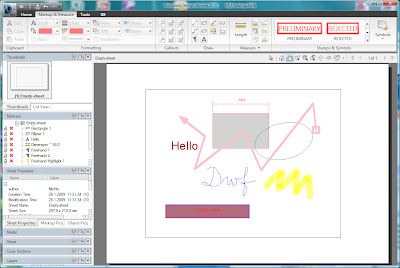 With DWFx you can view your drawings natively, without any viewer in Windows Vista, or Windows XP with MSIE7. Some of the CAD functions in Design Review are not available even in the big AutoCAD. E.g. you have access to the history of the individual entities - you can see who and when has created each line.